I know, I know: The last thing you'd expect me to be reviewing is a manga about a kitten, but here I am, talking about the brand-new Vertical, Inc. release of Chi's Sweet Home by Konami Kanata. What may surprise you even more is that I actually like it! 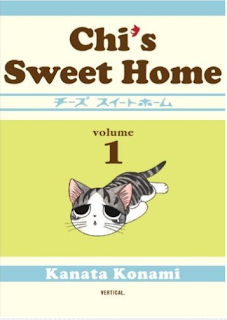 The entire plot of Chi's Sweet Home can probably be summed up by simply reading down its table of contents, which contains chapters like "A cat is lost," "A cat is found," "A cat forgets," and "A cat understands." In fact, the comically straightforward nature of the titles underscores simplicity as the fundamental attribute of this manga story of a stray cat named Chi and the Japanese family that takes her in. It's actually rather surprising to see such simplicity in a manga serialized in a seinen (men's) magazine, Weekly Morning, but as with many cutesy seinen titles such as Yotsuba&!, the manga is actually much more attractive to American children than it is to American men. Pursuant to this, Vertical's translation keeps the dialogue brief and easily comprehensible, while the intentional lack of detail in the art breaks with seinen's American reputation as being (sometimes indecipherably) detail-heavy. What's more, the book has only full-color pages, painted in beautiful, subdued pastel colors, which are sure to entice young readers looking for something more flashy than the typical black-and-white manga aesthetic. On that note, Chi's design is easily the most important piece of art in the entire book, and it certainly gets the job done — and then some. Her saucer plate eyes and giant triangular mouth express a childlike excitement over even the simplest of everyday delights, and it can be hard to not imagine her screaming at the top of her lungs and smiling every time she gets excited. (By the way, this is coming from someone who has never seen the anime and thus doesn't have a preconceived voice for Chi.) Believe me, I didn't think that I would enjoy it, but I really took to Chi and the rest of the family after a few chapters. Still, I feel like the comedy — if you can even call it comedy per se — might wear a little thin if the later volumes don't introduce any major new developments. After all, I don't really think that a picture of a cute kitten getting excited can remain very interesting for very long. The chapters range in length, though they are typically much shorter than the average manga chapter, and some even come in at around five or six pages. Given such brevity of storytelling, it would almost seem like the story is built for the 4-koma (four-panel) format, but Kanata manages to tell a short, charming story in every chapter while maintaining the flow of a full-page manga layout. As I mentioned before, Chi's Sweet Home doesn't really feel like a men's title in an American context, but it's actually a genuinely fun little book for children or cat lovers of all ages. Of course, I wasn't satisfied with simply guessing at the right audience for the book, so I let my 12-year-old sister read it to get a feel for what she thought of it. Within an hour she had read the entire thing, and claimed that she would actually buy the second volume if she saw it in a store (even after I informed her of the slightly high $13.95 price point). To be clear, Chi's Sweet Home is not for everyone, but when put in front of the right eyes, it's an absolute joy. Kanata has crafted a simple yet charming mix of visual comedy, cute animal shenanigans, and great art that can manage to evoke quite a few chuckles, even from this jaded manga reader. This review is based on a promotional copy of the graphic novel, kindly provided by the publisher, Vertical, Inc.